...to my oldest child. My oldest, Bessie, just turned 23 this last Sunday and it is really the first time ever that we haven't seen her on or right around her birthday. Wow. What a strange thing to do to hear about how your child celebrated her birthday! She lives in another state and recently changed jobs so between her work schedule and our life schedule we weren't able to get together. Well, I guess it will be all the more sweet when she comes home at the end of this month for her little brothers high school graduation. I did make her a card....I tried a new design and am not really sure how I feel about it. I really like using these little Samantha Walker/JustRite/Spellbinder Banner and Buntings dies. I love this little row of flags and have used them before with a colored banner on an all white card and I really liked how that pop of color stood out. I was looking for a fun, colorful "party" look to this card and I think that I fell more on the colorful but messy side! Oh well. I know Bess will love it and the accompanying giftie. This is a look that I am going to work on though. I have seen these banners used criss-crossed like this before on other people's cards and have just love the look but here it looks kinda cluttered and bunchy to me. Any suggestions? Anyhoo...thanks for stopping by. I have been a bit MIA lately and that is due to a small window of pleasant weather and the need to get my yard into some semblance of order in preparation for the hosting of my son's graduation party. It seems like the time is just flying recently and there is much more work to do than I have hours to do it! Isn't it nice to be busy? Although, I am going to try to get a few moments to myself in the next day or two to try out some new goodies that have been sitting untouched for a few weeks (YES!!!! WEEKS!!!) now. I can't wait to sit and play a bit! I love this card and don't see any need to change anything about it, Sheila! I am sure your daughter was thrilled to get it in the mail. It is very strange when the kids start moving away and living life apart from us, isn't it? Awesome card, Sheila! Love the bright colors, and your banner is so fun! She'll love it! Fun birthday card! Happy birthday Bessie! Cheery & fun--love the colors, Sheila! I haven't done much with banners, but I think yours look cute. Happy Birthday to Bessie... my daughter was 27 on the 6th and as she lives in another country a 9 hr flight away, so know how you feel. Your card is wonderful Sheila and no doubt she loved it! 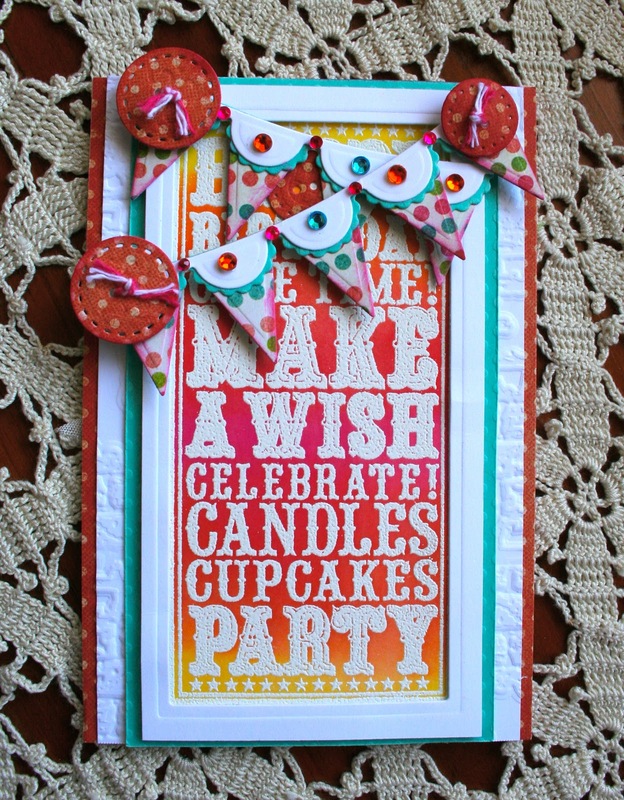 I think your banners add a wonderfully playful touch to your card Sheila! I really love the colors you used! Enjoy the warm weather- we've been having some here and it's hard to stay inside! Not messy, magnificent! 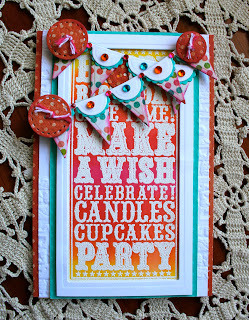 A real party in a card - such fun colors and I can just hear those banners fluttering in the breeze. Bessie will love it. I agree about time for crafting - there is just so much to do outside. You are a good mom, Sheila. And so very creative.